It’s Friday and that’s cause for a little celebration, a little dancin' with the usual Adorable Closing Gif, but first you have to read on to get there! No scroll-cheating, either. (That's kinda the way the week works: You can't just jump ahead to Friday, people!). 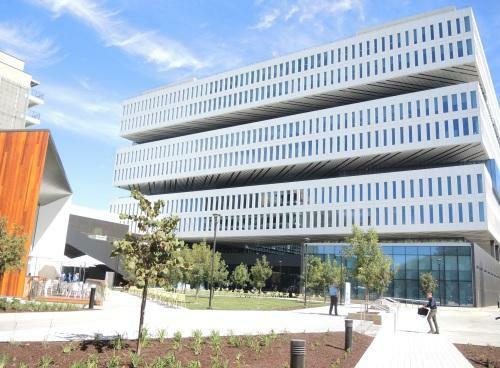 There was little bit of celebration down the road from our San Jose offices this week as Samsung Electronics opened the doors on its massive new San Jose building (right) on 1st Street. The Verge’s James Vincent reports the $300 million edifice will hold 2,000 sales, marketing and R&D people, and checks in at 1.1 million square feet. What’s interesting to me is how Silicon Valley architecture is changing. The Samsung building is distinctive; there’s no doubt. Some have described it as looking like a Rubik’s Cube. Now consider Apple’s “spaceship” headquarters campus, under construction on the west side of the Silicon Valley. These two designs herald a change from the scores of low-rise, relatively nondescript buildings that have sprouted up in the Santa Clara Valley in the past four decades. Meanwhile, a Samsung executive said the company won’t play favorites when it comes to logic IC supply, according to Bloomberg’s Ian King. Remember the $9 CHIP? It’s now shipping, according to Liliputing’s Brad Linder. He reports that the CHIP features a 1 GHz Allwinner R8 single-core processor, 512MB of RAM, 4GB of storage, 802.11b/g/n WiFi, Bluetooth 4.0, and a composite video port. There’s also a USB port, a micro USB port, and a series of developer pins for attaching hardware. Pre-orders can be placed on the Next Thing Co. site. In other innovation news, Arrow has launched the $75 Qualcomm Dragonboard 410c, and our friend Charbax has a review and an interview with Linaro (Linaro Company Overview) and Arrow (Arrow Electronics Company Overview) folks. Separately, the Dragonboard 410c was the centerpiece of a cool Qualcomm concept (Take the Qualcomm Challenge at the Techcrunch Disrupt Hackathon) that was part of the TechCrunch Disrupt Hackathon last weekend. I hope to have results from our Qualcomm friends next week. Stay tuned. Lastly, check out all the latest boards at our Single Board Computers. Trust is, in many ways the root of future electronics growth. And there’s no application where the security conversation is more animated than in IoT. Gartner this week argued that IoT platforms will redefine security going forward. Patrick Nelson, at Network world, has the story. In related trust developments, ARM’s Rob Coombs tells TechWeekEurope that people “don’t do passwords well.” The consequences of that laziness can be dire. But there are solutions, notably FIDO. What’s FIDO? Rob tells us. Yes, the Signature Touch, handmade in the U.K. By Vertu, starts at $9,000. It runs Android Lollipop on a Qualcomm Snapdragon 810. Gordon Gottsegen at Wired has a complete review. Think about it. You could make someone very, very happy this holiday season. Useful goggles. Check. Cool design. Check. Automatic battery changing? Wha-what? That’s probably the neatest feature of the Flyby drone, currently an Indiegogo campaign and expected out in 2016. CNET’s Michael Franco tells all. Samsung Electronics is really rich, open new office in Silicon Valley I think cost huge.